Fortinet has been a leader in protecting IPv6 networks since 2007, achieving both IPv6-Ready and JITC certifications in 2008. You can rely on Fortinet's years of experience in delivering consolidated, high performance security for IPv6 environments to help you execute your migration strategy. Our unified threat management solutions help you increase protection and improve performance while simplifying your network. 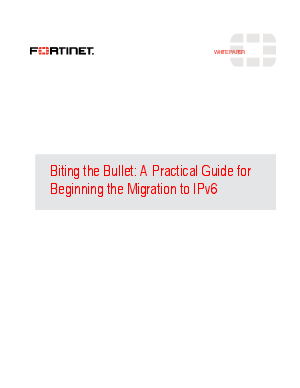 To help you get started down the path of IPv6 migration, we created a white paper, "A Practical Guide for Beginning the Migration to IPv6" that describes the importance of securing the network against IPv6 threats well before the introduction of any IPv6 traffic, and how to begin securing a transitional IPv4/IPv6 network. FortiGate™ consolidated security platforms are IPv6 compliant today with dual-stack implementation and hardware-accelerated IPv6 support. Our long commitment to protecting IPv6 networks means that you get the visibility and control you need to detect and block threats delivered via IPv4 or IPv6, without having to resort to tunneling or any complex address translation.